Broadview, Assiniboia - Joe Jones, the Welsh-Canadian writer who has thrilled a Generation of mystery lovers with his thrilling Detective stories of Dash Eagle, Private Detective, became embroiled in a real-life Drama yesterday afternoon when he stepped into Broadview Sweets for a stick of candy and instead found himself in the midst of a Villainous Robbery. Jones witnessed a swarthy, dull-eyed assailant threaten the candy store's aged proprietor, one Nick Applodious, with a heavy cudgel.Thinking quickly, Jones seized a jar of pennies from the counter - presumably placed there for the day's accounting - and hurled the heavy missile like a Champion Rounder. "I yelled 'I'll knock some cents into you' and threw the jar," Jones recounts. "I was probably more surprised than the Burglar when the Pennies hit him square in the forehead, knocking him out cold. Rather than call the cops, this situation called for some Copper!" 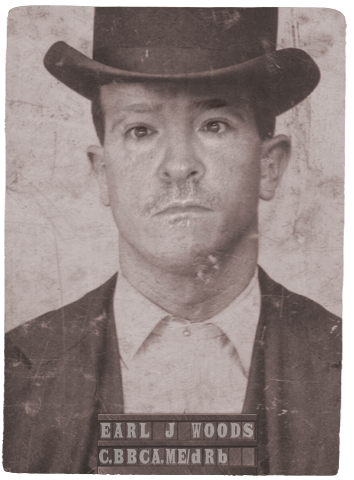 The Miscreant, identified by Broadview constable Henry McTavish as one Earl J. Woods of no fixed address, was laid low by the blow. Applodious informed the RCMP that even had the robber successfully carried his plot to conclusion, it would have Profited him little. "On a slow day like today I've naught but Nickels and Dimes in the register," Applodious confesses. "Had he stolen every coin, every gumdrop, every lolly and all the soda in the store he may have escaped with ten or fifteen Dollars' worth of goods - hardly worth it with today's hyperinflation." Woods will be transported from Broadview to Regina for trial this week. I laughed at "I yelled 'I'll knock some cents into you' and threw the jar".